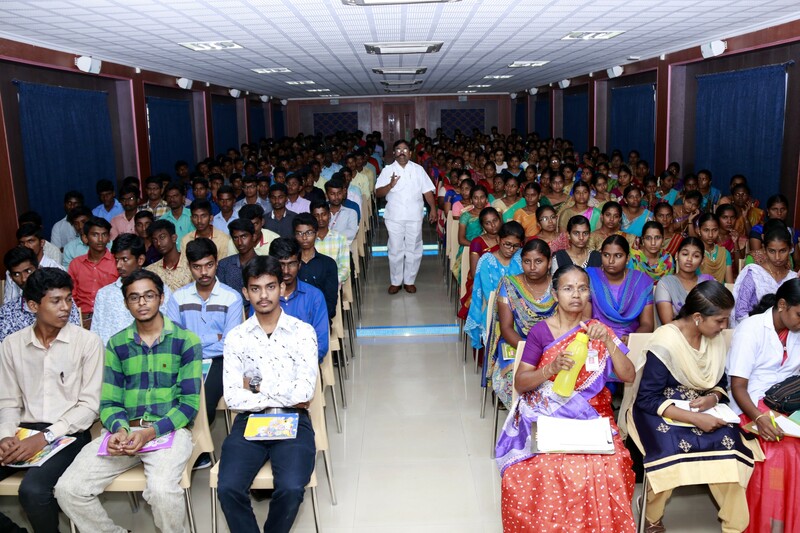 The Faculty Development Department organized a batch-wise six day orientation programme for the first year engineering students of Paavai Engineering colleges. 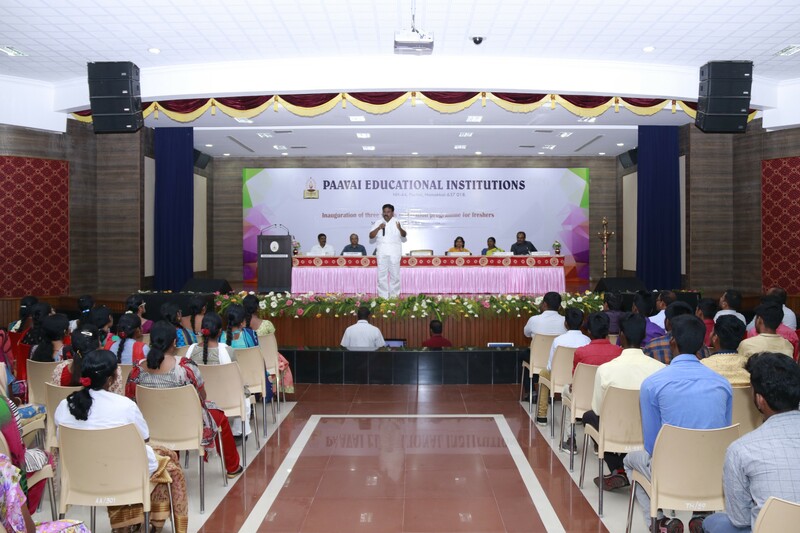 The orientation programme was held from 07.09.2018 to 24.09.2018 at Prestige Hall, Kalam Chamber, Pragathi Hall and Tata Hall. 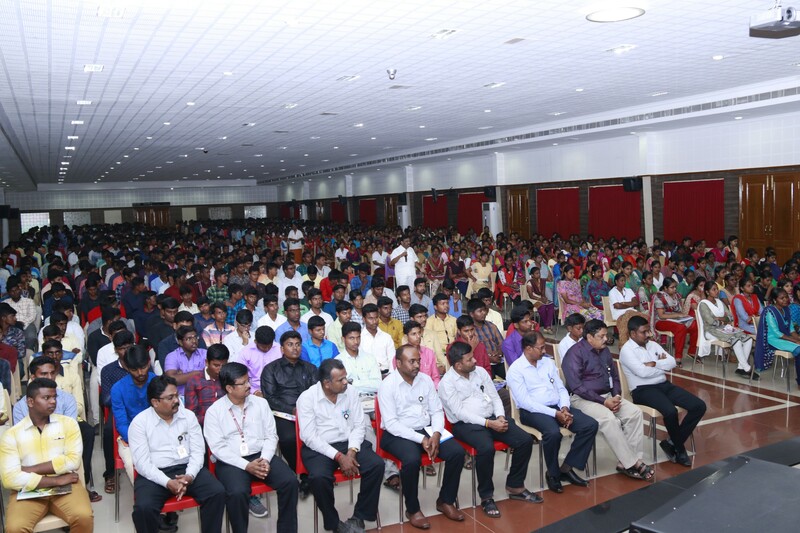 The students were divided into seven batches and the resource person addressed the students concurrently on specified dates allotted for each batch. 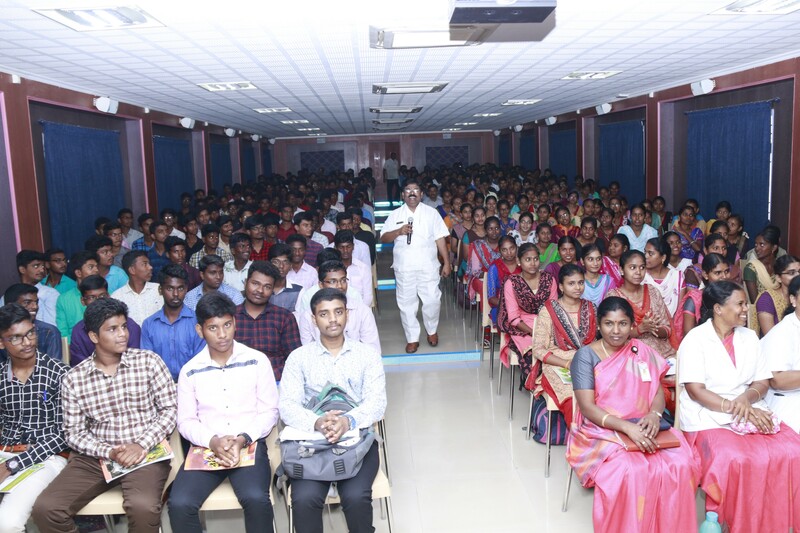 To begin with, a general Inauguration for the student beneficiaries was held, at the ‘Anandha Arangam’ on 07.09.2018, wherein Shri.CA.N.V.Natarajan, the Chairman stated that the difference between ordinary and extraordinary lies in the practice and training that one undertakes. Therefore he advised the students to be more interactive and positive in understanding the need for orientation programme. He also cited live examples of few youngsters who succeeded on account of their passion for leading a good life and those who did not shine well in their life for want of proper goal, direction and dedication.The chairman desired that the young minds should be goal oriented. Mrs.Mangai Natarajan, the Correspondent stated that the students should be disciplined, bold and courage to do a right thing always. She said that the students should respect their parents who sacrifice so much for their wards and so the grownups should meticulously discharge their responsibilities by taking into account the good things that are taught at Paavai. 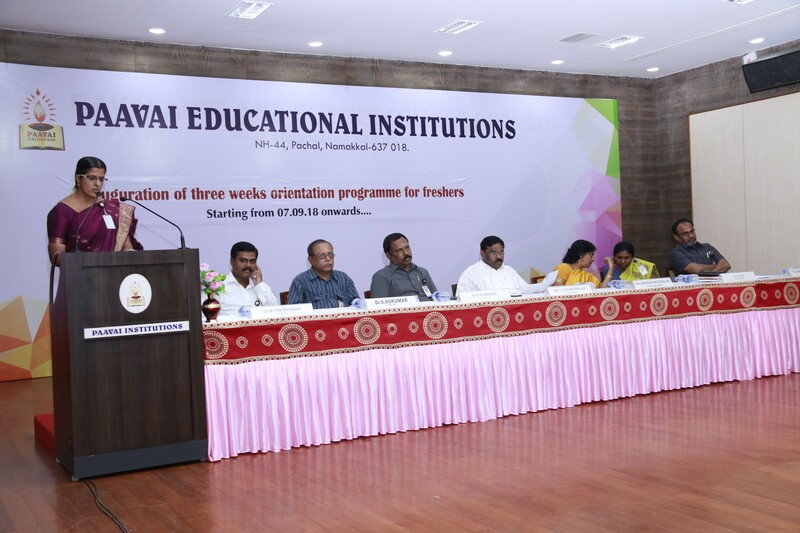 Mrs.K.Subashini,AP, Faculty Development Department read out the objectives of the programme. The principal objective is to make the students to acquainted with the institutional practices and culture by preparing them for the transition from school to professional education outlooks and prospects. After the inauguration, the students were assembled in their respective halls and the following resource persons handled the topics assigned to them in the concurrent sessions. 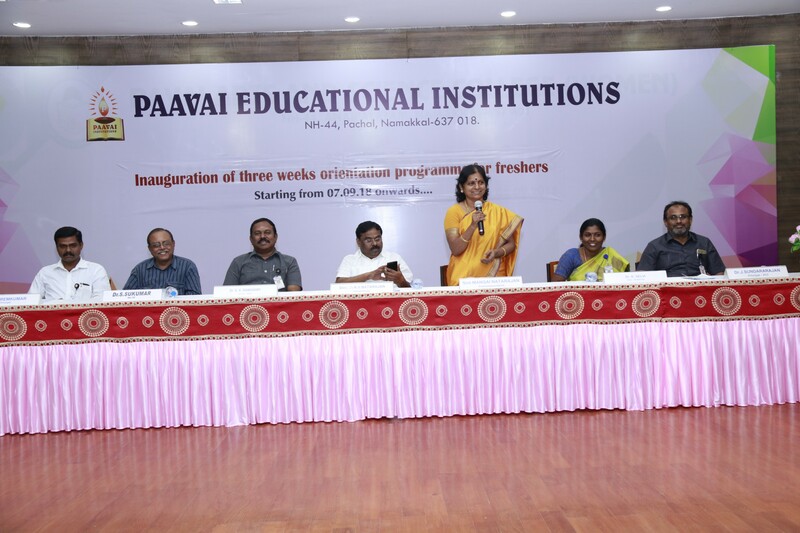 Shri.CA.N.V.Natarajan, Chairman, Paavai Institutions spoke on the History of Paavai and Goal setting. He explained the vision, mission and his strong determination to establish Paavai as a guiding torch to the youth folk. He further focused on the steps for goal setting and methods to translate one’s goal into a reality. In this session, the life incidents of various individuals were cited. 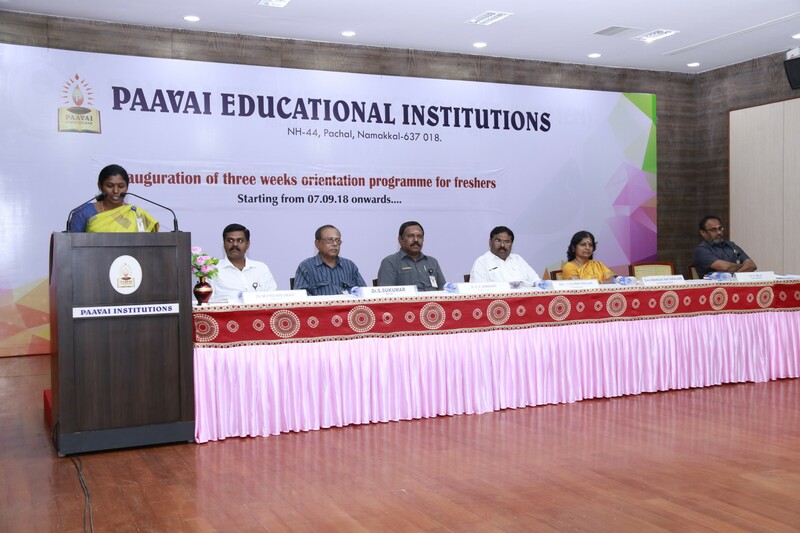 The principal of each engineering colleges highlighted the, “Achievements of Paavai to their respective colleges. Dr.M.Premkumar, Principal, PEC, Dr.J.Sundarajan, Principal, PCT, Mrs Vimala, Maths HoD, PCE”presented their sessions. Dr.S.Sukumar, Dean, Civil elaborated the learning techniques to motivate the students to secure university ranks. Dr.K.Selvi, Dean Academics focussed on Paavai Culture, and the importance of adhering the best practices in one’s life. 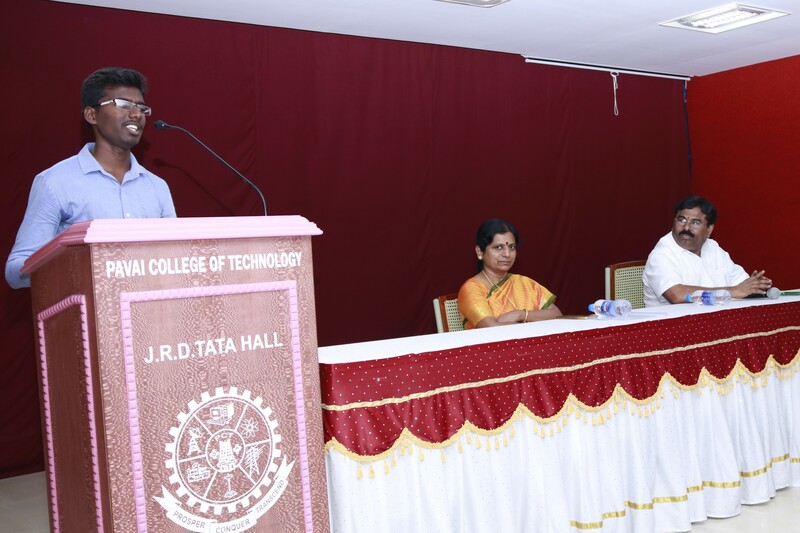 Dr.A.S.Kandasamy, Dean ECE, highlighted the importance of Time management, basics of the subjects, Vocabulary. He elaborated the role of the students and the learning process. At last he made students to realise the worthiness of their elders. 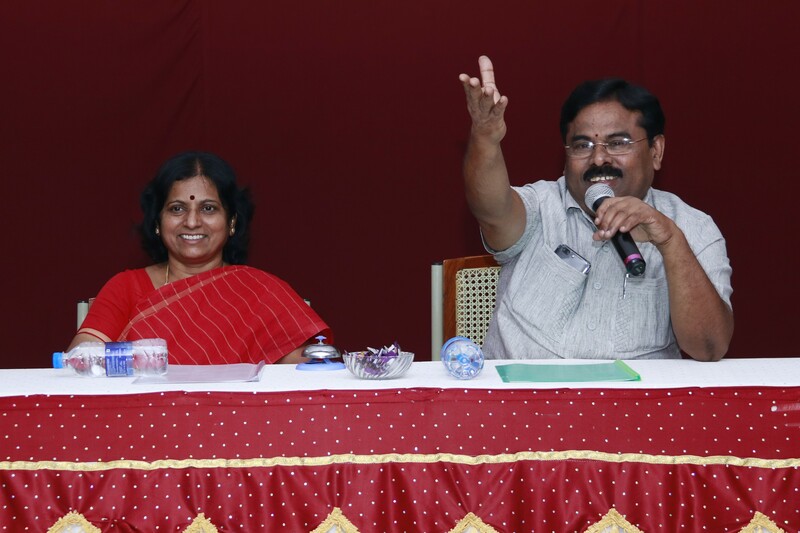 Dr.B.Murali Babu COE outlined the rules and regulations of an autonomous institution. He further stressed the importance of internal and end semester examinations. .Similarly, Dr.Saravanan HoD, EEE PCE and Dr. Dinakaran,Mech, HoD PCT gave a clear picture on Anna university examination system and other support programmes. 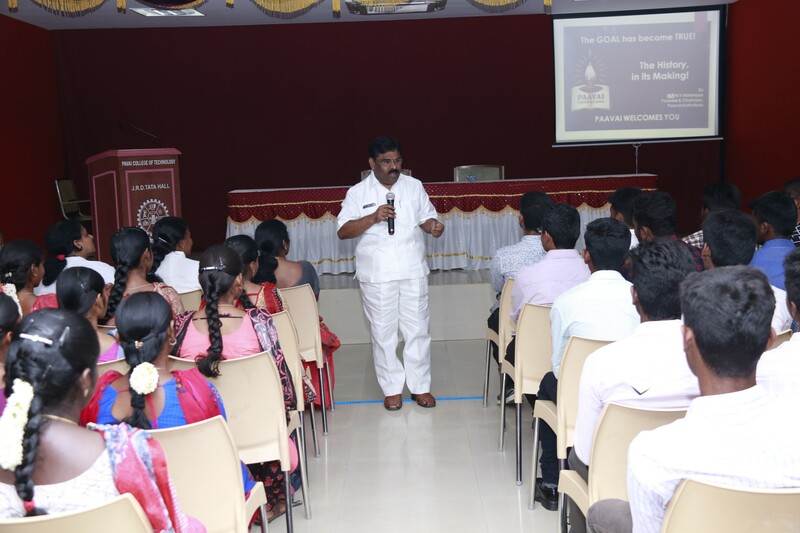 Dr.Arangasamy,HoD ECE lectured on the title, ‘Value Education’. He further discussed on the classification of values and methods to develop and inculcate values. In this orientation programme the resource persons adopted the technique of stress free listening and learning practices for the fresher’s. The beauty and excitement of understanding of Mathematics was given by Mrs.Subashini through puzzles, games and videos involving creative approaches to Mathematics. Mrs.Vimala, Mrs Yasoda and Ms.Jaya from Maths dept of PEC, PCE and PCT taught the basics of Mathematicsin engineering education to the students. Equally to instill confidence in spoken English, Mr.Janaki Raman, Ms.Tresa, Gayathri, Vanitha from English department expounded the essence of Communication skills. The faculty members made English easy to the learners by pointing out the difference between skills, talents, pronunciation, vocabulary building strategy, interactive sentence making and every day simple sentences. At the end of the sessions students felt that the language competence confidence matters more. So the students were advised to focus more on fluency rather than accuracy. Following Mathematics and English, the first year science faculty brought in lot of experimental based learning modules to excite the freshers, as how science operate the universe. Pertaining to each discipline the science faculty changed their mode of presentation. Mrs.Bharathi, Mrs.Rathi, Mr.Jagadeesan, Physics dept offered suggestions for studying physics with ease and effective.Since Engineering students need to develop the spirit of inquiry and problem solving ability, Dr.Gopi, Mr.Jagadeesan, Chemistry dept explored through lectures and demonstration proven strategy and techniques that will, if applied improve one’s ability to understand and learn chemistry with total concentration and focus. Dr.A.Suphalakshmi, Dr.AntonyRaj and Dr.Saravanan, HoDs of CSE dept of PEC, PCE,PCT presented on the title, ‘Fundamentals of Computers’. Their main thrust areas were evolution of computers, Generation of Computers, Growth of computers, Digital evolution and so on. The frame for the orientation Programme included not only the subjects but also life skills and personality development sessions too. Mr.Loganathan, Head, Audio-visual dept, took an exclusive session on first aid and life skills through various videos and shortfilms. He told the students that the ability to network and empathize in times of emergency, distress or calamity can help to build the resolutions rather than resentment. Mr.Loganathan encouraged the students to give importance to filial duties and family culture. As peer learning results in better involvement, Paavai alumni was invited to motivate the freshers. Mr.Elavarasan, gave a session on yoga and meditation. It was showed through demonstration that yoga can make fitter and abler. Yoga relieves one from stress and enables one to perform well with discipline, control and concentration. 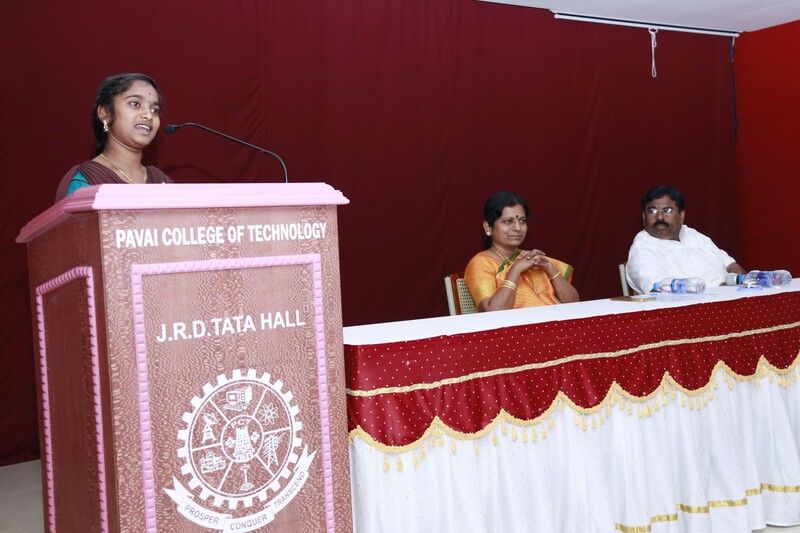 Following the wellness programme, representatives from the final year students from each engineering colleges interact with the first year students on various clubs and association which have been smoothly functioning on paavai campus. They talked about various curricular, co-curricular, extracurricular club activities like Aura, sparism, Astra, the cultural fest, which provides an avenue for students to showcase their innovation, skills and talents. They motivated the students to participate in all association and club activities. They also elaborated about the upcoming PECMA, to learn the interpersonal relationship and leadership qualities. In addition to these inputs, all the HoDs of the departments gave a special session on the achievements and scope of their departments and how the students have to contribute to the academic growth of the department.. Mrs.Mahalakshmi, Additional Training and Placement officer, gave a big drift in the placement and its importance.. 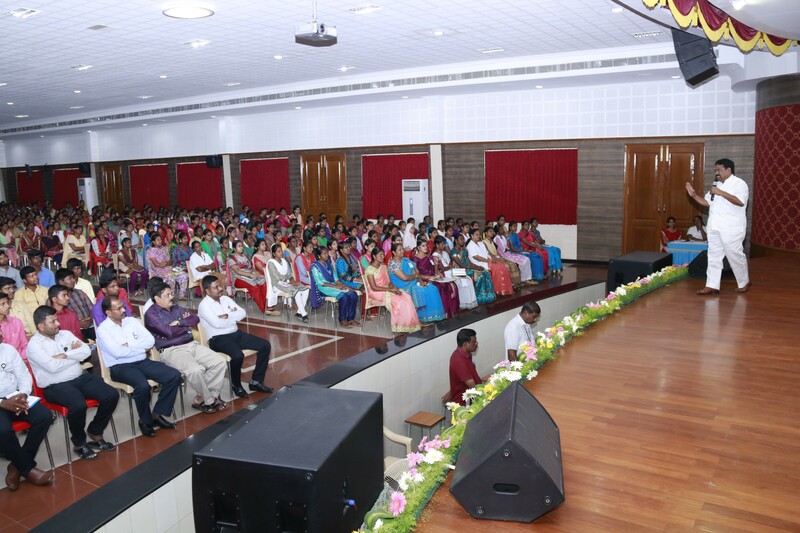 In this regard, she explained the importance of career and enabled students to work towards getting placed in the reputed institution. The students toured around the campus and learnt about the centers of excellence, they were given a panoramic view of paavai and its infrastructural facilities. Each resource person elaborated the titles and had an interactive session with the students. Around twenty five sessions had been handled in these six days. 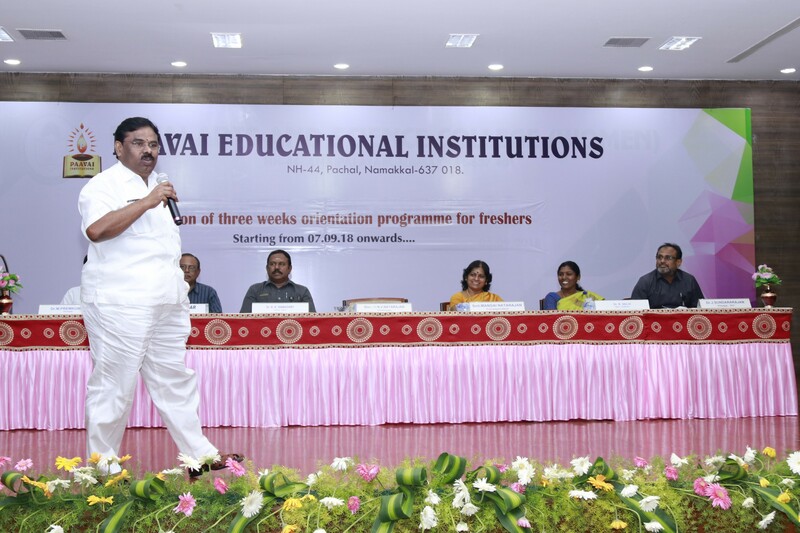 The programme thus catered to the needs of the students and the Faculty Development Department expressed its willingness to be with them as and when required. 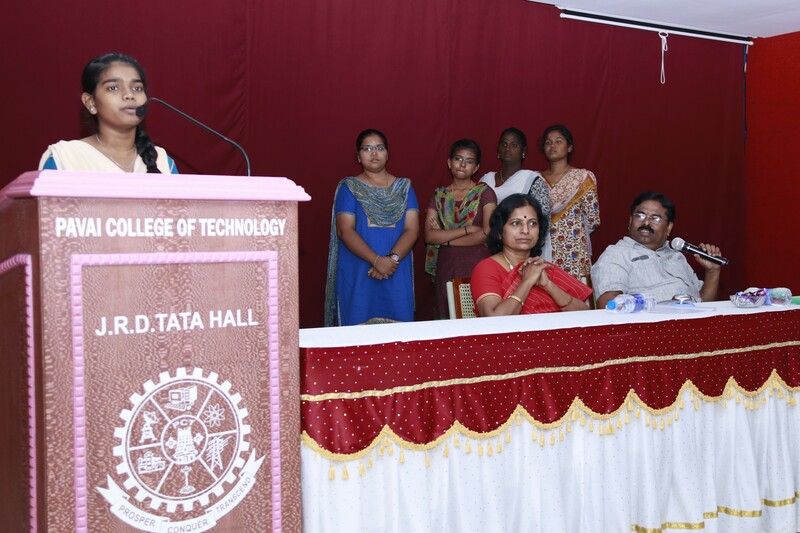 The valedictory function was held on 24.09.2018 at the Pragathi hall by 02.00 p.m. All the students recorded their feedback. Smt. Mangai Natarajan, the correspondent felicitated the gathering. She congratulated the students for expressing their desire to come up in life. The Chairman delivered valedictory address in which, once again, he reiterated that a well established goal is sure to succeed and Paavai stands testimony to it. After the national anthem the programme came to an end. Totally nine hundred benefitted through this programme.